In December 2010, both Digicel and Voilá launched mobile money services in Haiti in a bid to win the $2.5 million dollar prize offered by the Gates Foundation. Digicel came out on top, being the first to meet the requirements of making 10,000 transactions (100 agents, in 100 locations doing 100 cash-in/cash-out transaction each), and were awarded their prize on the 10th of January 2011 at a ceremony in downtown Port-au-Prince. Mobile banking is a promising solution to the problems that most poor Haitians face when trying to access financial services. Last year, I worked with Dr. Espelencia Baptiste and Dr. Heather Horst to research the movement of money and use of mobile phones around Haiti. Working in Port-au-Prince, Cap Haitien, Jacmel and Anse-a-Pitres, our report shows how poor Haitians face major obstacles when trying to send each other money or conduct simple banking transactions. We identified three major obstacles to the use of financial services in Haiti for the majority of poor residents: security, time and distance, and bureaucracy. Given that poor Haitians get by through sharing money and other resources, often across large distances, they find these obstacles to be very frustrating. Knowing how woefully inadequate financial infrastructure is in Haiti, we were very optimistic when we heard about the new mobile money services. Dr. Baptiste and I have returned to Haiti to watch as mobile money unfolds, with the continuing input of Dr. Horst. We want to see how people are adopting the service, what they're using it for, and if it is helping them resolve problems they encountered when using transfer service providers such as Western Union or public transport. We are also interested in its long-term effects on Haiti's monetary ecologies. Does it provide economic stimulation for the country and development benefits for the poor? What are its effects on how Haitians form and maintain social relations? While M-PESA has been very successful in Kenya, there is no guarantee that mobile money will work the same way in Haiti. Infrastructure–or lack of it–could propel mobile money to new heights of success, or render it unviable. Haitians may find creative ways of using the technology that its developers did not anticipate. Traditional pratik relationships between traders and clients might be altered, and demands for financial assistance might now extend to relatives who were previously considered to be too distant to have any obligations. It will be interesting to see whether mobile money will affect traditional face-to-face relationships or migration patterns between Port-au-Prince and the provinces. 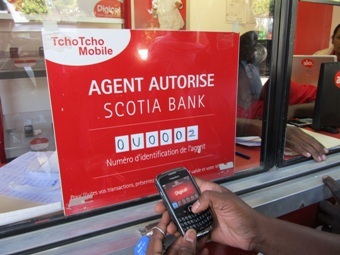 One month in, there are two mobile money service providers in Haiti: Digicel with TchoTcho Mobile, and Voilá with T-Cash. Digicel operates almost exclusively in Port-au-Prince, and Voilá operate almost exclusively in the provinces. Both are trying to recruit agents and expand their coverage as quickly as possible. There are some differences in the services. TchoTcho Mobile is more difficult to sign up for as they require the aspiring client to visit an agent in person and provide a photocopy of their identification (if the business doesn't have a photocopier). T-Cash is easier: clients can register over the phone. Both currently allow money deposits and transfers, but you can't yet pay bills like with M-PESA in Kenya or G-Cash in the Philippines. Their pricing structures are fairly similar, and much cheaper than sending money by almost any other means. It works like this: a client finds their nearest agent by calling a number and speaking with an operator. The client enters the agent's store and asks to top up their mobile money account. They hand over their personal identification and the money they want to deposit (from 25 gourde to 10,000 gourde) along with the fee – there is no visible fee for a deposit. Fees for transfers and checking one’s balance are taken out of the user’s account. The agent does the transaction with their own mobile phone, and the client receives a text message saying that their account has been credited. When a client wants to transfer money or top up their mobile credit, they call the number provided and use their keypad to conduct the transaction. They don't have to talk to a person: they send free SMS messages from their phone to their service provider to conduct the transaction. A client can transfer money to any mobile phone in Haiti, and the receiver doesn't have to be registered with the mobile money service or even use the same mobile service network. Clients can also top up the credit of any Haitian mobile phone. To withdraw money from a mobile money account, the receiver can go to any agent and present their valid identification. The money doesn't have to be withdrawn – clients can use their mobile money accounts to store money (often safer than storing it in their homes) or save money (avoiding bank fees and slow lines). In addition to understanding the continued efforts and challenges around moving money within Haiti, we have started talking to some of the first users of mobile money services in Port-au-Prince, most of whom are enthusiastic and excited about the new services. While there are some problems with infrastructure (such as the service being down), they don't seem to be significant compared with the many other infrastructure problems that Haitians face in their daily lives. We are hearing that the services save time and money, and help users overcome the bureaucratic hurdles involved in using banks and pre-existing money transfer service providers. Over the next few months we will be keeping watch as mobile money unfolds to take stock of its socioeconomic effects and see how it is being creatively adapted to the needs of different people in far-flung corners of the country. --Photo #1: Winner of the Haiti Mobile Money Initiative: Digicel's TchoTcho Mobile, by Erin B. Taylor, 2011.